Sterge’s company ZiSoft Ltd is a Software House specialising in Computer Aided Software Engineer tools, Healthcare Management Software, Telecommunications Network Management Systems, Video Lottery Terminal Software and Real-time web-based apps for financial monitoring in the gambling sector. Instant help and liquidity issues were resolved in days. I’d appointed a high street accountant to look after my business accounts when I set up the business. A few months in, I realised that my company information was incorrect and out of date on the HMRC and Companies House systems. My monthly figures were a mess and static funds were accumulating in our accounts as a result. We felt ignored and uneasy. We moved and chose an online accounting firm, but the transition was lengthy and we couldn’t get hold of any of their accountants to discuss progress. The delays resulted in us being unable to make the monthly payroll. I ascertained that the ‘front line’ was a call centre and that the accountants worked part-time in the evenings and at home. Enough was enough and I knew we had to get back on track as soon as possible. I gave Matt a call and within minutes we were on the right track. He listened to my concerns and within days we were up and running on the inniAccounts system. The inniAccounts team resolved all the inaccuracies with HMRC and Companies House as well as removing all our liquidity issues. inniAccounts are easy to speak to and contact, versatile and flexible. Claire, our Account Manager is there when we need her; we get a response to emails in less than 12 hours and we can check any aspect of our accounts anytime online. I can check available cash to payroll details within a few clicks plus I get upcoming tax and VAT return reminders in plenty of time so I know what’s ahead. 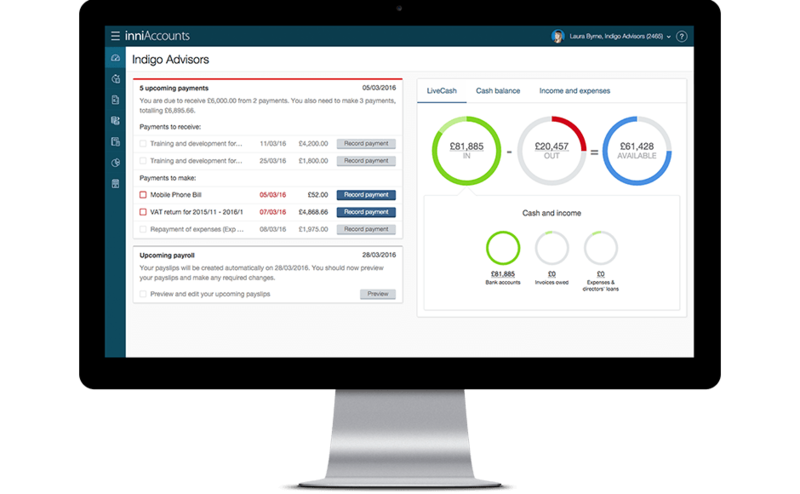 We use the web app a lot; issuing invoices, recording expenses and for payroll management. Team that with inniAccounts’ ability to get us back on track and running smoothly again, we’re in a much healthier position than we were a few months ago. I can get on with running the business while I know that our accounts are in safe hands. inniAccounts offer such a cost-effective service, excellent value for money and a time-saving experience. If you’re looking for a new accountant, go for it! Experiencing it is believing! You’ll be in the right hands!